WASHINGTON – Over its 20-year history, the Washington-based Institute for Higher Education Policy (IHEP) has been known nationally for the research and analysis it conducts to shed light on how federal and state policies shape college access and success for low-income and socially-disadvantaged students. However, during the institute’s annual national summit event on Tuesday, data-heavy research took a decidedly lower profile as IHEP leaders premiered a documentary to showcase first-generation college-going students describing the challenges they overcame to gain admission to and, in two cases, complete college. In “Redefining Access for the 21st-Century Student” documentary, five students told poignant stories of how they struggled during their high school and young adult years to get into and find stable paths in college. 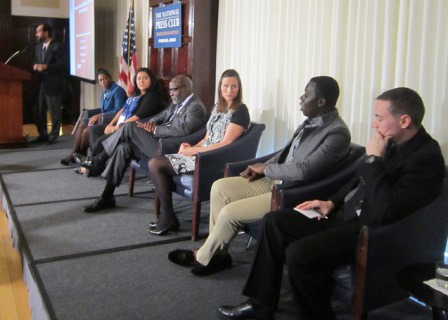 Following the film’s showing, the five students—Andrea Fitch, Donald Richards, Jenell Holder, Sharon Flores and Traval Mensah—participated in a panel discussion along with Dr. Charlie Nelms, founder of the Destination Graduation Initiative and former chancellor of North Carolina Central University, who also appeared in the documentary. In the film, each student describes the challenges that he or she has either overcome or continues to battle. In addition, high school and college counselors add details to the stories of the featured students, whom they have helped and counseled. Commentary on the challenges low-income and first-generation students confront in seeking to attend and complete college is provided by experts such as Nelms and Dr. Arnold Mitchem, president emeritus of the Council for Opportunity in Education organization. A veteran with military service in Iraq and Afghanistan, Richards talks about grappling with “two bureaucracies,” meaning that of the military and South Dakota State University, where he remains a student eight years after first enrolling at the school. As adult students, Fitch and Holder face similar challenges enrolling in college several years after finishing high school. Fitch, a married mother of two, recently completed a bachelor’s degree at Colorado State University, while Holder, an online student, expects to complete an undergraduate degree at the University of Maryland University College by the end of 2014. The youngest students, Flores and Mensah, navigate their way from high school to their respective schools while dealing with finding the right institutional fit and financial aid issues. Mensah, a community college student in northern Virginia, has the added burden of figuring out an academic pathway that will enable him to transfer eventually to George Mason University, a four-year public university. Cooper said the documentary represents IHEP’s effort to turn the attention of higher education advocates and policymakers back to college access issues. “In all of our work, we stress the importance and interconnectedness of access and success,” she said. Cooper contends that the focus on college success, largely inspired by the Obama administration’s college completion push, by some in higher education appears to be marginalizing college access as an issue. IHEP “recognizes that this movement has led some people to believe that, because of the [college success] emphasis, we have solved the access problem. And my friends, that is simply not true,” she said. IHEP is organizing screenings of the documentary at higher-education-related events throughout 2014. In addition, the organization expects to release its redefined framework for access and success for the 21st-century student in 2014. During the summit, IHEP also bestowed awards to institutions and individuals for demonstrating “exceptional leadership for improving access and success for underserved student groups.” Individuals recognized for their service were Mitchem; Richard W. Riley, former U.S. Secretary of Education; Mary Beth Marklein, an education reporter at USA Today; and Dr. Clifford Adelman, a senior associate at IHEP.